North Cyprus is the perfect holiday spot when it comes to beach holidays. The coastline is varied and is ideal for swimming, surfing, and much more. You can find secluded beaches where you can enjoy a quite day sunbathing especially if you have a hire car and can take the time to explore. The beaches that you will find along the eastern and northern shores of North Cyprus are surrounded by the clear blue warm waters of the Mediterranean and if you explore the coastline in your hire car you will find bays and beaches where you can swim and sunbathe no matter what time of the year it is. Hiring an opel zafira 7 seater will give you all the room you need to take those all important beach items and a picnic too if you choose. Kyrenia in North Cyprus is home to some beautiful beaches. Here you will find sandy beaches that come with all the facilities you will need and there are also some quieter secluded beaches if you want a day away from it all. All the beaches in Kyrenia are perfect for swimming and snorkelling. Famagusta is known for its miles of beautiful sandy beaches. Some of the beaches in this area are however hotel owned and you will be charged a small entrance fee to use them. Some of the beaches that you will find in Famagusta come fully equipped with beach bars, sun loungers, and more. All the beaches here are safe and have perfect conditions for both swimming and snorkelling.Sometimes it is really hot in high season especially in August so, Pacific Rent a Car advice you to hire an air-conditioned car like Hyundai Matrix. If you are travelling a lot please hire a car with A/C. 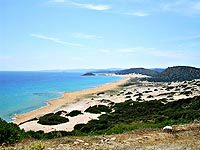 Karpaz is an excellent location if you are looking for empty sandy beaches that stretch for miles. Malibu beach is perfect for swimming and here you will find crystal clear waters and a snack bar if you forget to pack your picnic. The Golden Sands is a stretch of the coastline that runs for approximately 5 miles and it is here you will find some of the most spectacular unspoilt beaches and scenery. In the summer months this beach is home to turtles that breed here and you are asked not to disturb them.